Occasionally innovation requires the replacement of an older model with a brand-new machine, which features all new functionality but still offers the features that you have come to know and love in your current machine. 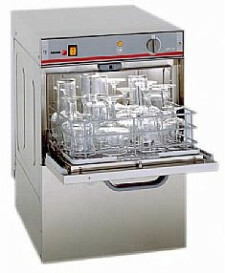 Until recently, the Fagor LVC12 Glasswasher was highly popular with pubs thanks to its utterly automated operation and Detergent and Rinse Aid Pumps, which are fitted as standard and integral to the machine. Introducing the Fagor CO402DD Glasswasher, part of the all-new Concept range from Fagor and a direct replacement for the LVC12 Glasswasher. The new model features a sleeker design, and a complete replacement of the control panel with an easy to use button interface. LED Displays show the status of the current wash cycle and the temperature, while the double-skinned door ensures that the noise and heat are contained within the machine, making it perfect for a front of house installation, or installation behind the bar. The machine now offers not only the 2-minute wash cycle of the LVC12 but also a 90 second and 3-minute alternative, allowing for slightly shorter or longer washes depending on your requirements, which can be selected via the control panel. Bar, clubs, pubs and restaurants that have enjoyed the Fagor LVC12 and are looking for a direct replacement when they next need to update their machine should look to the Fagor CO402DD. It provides a bolstered list of features, alongside all the standard functionality that they are used to.